, brightest star in the constellation Taurus; Bayer designation α Tauri; 1992 position R.A. 4h35.5m, Dec. +16°30'. An orange giant star (spectral class K5 III) with apparent magnitude averaging 0.
, in astronomy, famous open star cluster in the constellation Taurus; cataloged as M45. The cluster consists of some 500 stars, has a diameter of 35 light-years, and is 400 light-years distant from the earth. , in astronomy, open star cluster in the constellation Taurus, located immediately to the right of the bright star Aldebaran. The cluster is about 130 light-years from the earth. It consists of about 100 stars all moving in the same direction. ..... Click the link for more information. (M1). Taurus reaches its highest point in the evening sky in January. Turk. Nemrut Dağ, mountain in SE Turkey, in the Anti-Taurus Mts. Rising 7,052 ft (2,150 m), it is the site of the mausoleum of Antiochus I (c.69–c.34 B.C. ), king of ancient Commagene. , Turk. Külek Boğazi, mountain pass, S Turkey, leading across the Taurus range. Known to the ancients as the Pylae Ciliciae, it follows the gorge of the Gökoluk River. ..... Click the link for more information. , N of Tarsus, is the best known. The mountains have long been a barrier to movement between the Anatolian basin and the Levant. The range has important chromium deposits and other minerals (notably copper, silver, lignite, zinc, iron, and arsenic). The Anti-Taurus are well wooded. (tor -ŭs) (Bull) A large zodiac constellation in the northern hemisphere near Orion, lying partly in the Milky Way. The brightest stars are the zero-magnitude Aldebaran, the 1st-magnitude Elnath, which was once part of the constellation Auriga, and several of 2nd and 3rd magnitude. The area contains the prototypes of the RV Tauri and T Tauri stars, the Hyades and Pleiades, both beautiful open clusters, and the supernova remnant the Crab nebula with its associated optical pulsar. Abbrev. : Tau; genitive form: Tauri; approx. position: RA 4.5h, dec +15°; area: 314 sq deg. 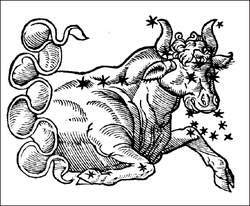 A sixteenth-century woodcut of the constellation Taurus the bull. Reproduced by permission of Fortean Picture Library. Taurus, like many signs of the zodiac, does not have a developed mythology associated with it. Taurus is most often said to be the bull that kidnapped Europa. As the story goes, the god Zeus saw the princess Europa playing with female attendants on the beach and was filled with love for her great beauty. Zeus then transformed himself into a beautiful white bull, wandered into the group of females, and laid down among them. He presented such a peaceful appearance that they petted him, and Europa climbed onto his back. Zeus then unexpectedly took off swimming, eventually depositing Europa on the beach at Crete, where he made love to her. She bore him three sons and received three gifts from the king of the gods—an unerring spear, an inexorable hound, and a bronze man who drove away strangers. Like Zeus, Taureans are fond of beauty and sensuality and like to place themselves in beautiful surroundings. They make a special effort to enjoy the good things of life. Similar to the bull of this tale, they are usually handsome and peaceful and are content to lie around and be “petted”; they enjoy receiving massages more than any other sign. They can remain calm when others panic but can explode into rage when pushed too far; though slow to anger, they have the worst temper in the zodiac when aroused. Like the unerring spear and the inexorable hound of the myth, Taureans are “doggedly” stubborn, pursuing a task in the face of all odds. And like the bronze man who chased away strangers, Taureans prefer the familiar over the new. The sign that the Sun was in at birth is usually the single most important influence on a native’s personality. Thus, when people say they are a certain sign, they are almost always referring to their sun sign. There is a wealth of information available on the characteristics of the zodiacal signs—so much that one book would not be able to contain it all. Sun-sign astrology, which is the kind of astrology found in newspaper columns and popular magazines, has the advantage of simplicity. But this simplicity is purchased at the price of ignoring other astrological influences, such as one’s Moon sign, rising sign, etc. These other influences can substantially modify a person’s basic sun sign traits. As a consequence, it is the rare individual who is completely typical of her or his sign. The reader should bear this caveat in mind when perusing the following series of sun-sign interpretations. You have a very practical nature and want to see concrete, tangible results for your efforts, and you are not one for spinning wild dreams that are unlikely to come into fruition. Most of your “wild dreams” have to do with material achievements, well-being, and security, for you have a great love of the physical world and you want to experience and enjoy it to the full. Though you will work long and persistently, you also have a strong sensual and comfort-loving side, and you want to enjoy what you have worked for. In fact, you can be enormously lazy at times and have a tendency to overindulge in good food and other earthly pleasures. You also love the beauty of the natural world and probably prefer a serene country setting rather than an urban life style. Ease, calm, naturalness—those are the spiritual goals of the Bull. Silence too. But not just the kind that comes from keeping your mouth closed. The Bull’s silence is deeper: it’s a quiet heart. Feel the wind in your hair. Feel the efficiency of your body, the rightness of its rhythms, the easy intelligence of your cells and muscles. That’s Taurus. The part of you that’s learning the lessons of the Bull is getting more grounded, more present, more receptive to immediate reality. As a result, it has a physical orientation and a practical feeling. It’s not so interested in abstract flights of speculation. It avoids the metaphysical Disneylands that seem to fascinate so many people. It specializes in the wordless mysticism of ordinary life. Feed your Taurean side with hands-on work: gardening, crafting wood or cloth, communing with animals. Soothe it with music. Restore and renew it with time spent close to nature—in the forest, in the mountain valley, by the ocean. Dress it in blue jeans and flannel. And never, ever, ask it to go to a cocktail party! With your Sun in Taurus, you renew your basic vitality in simple ways. Take a walk in the woods. Paddle a canoe. Build something of oak or maple. Your deepest nature is quiet, stable, solid. You benefit from having a strong tone of continuity in your life—especially in relationships. Keep in touch with old friends. Stay close to people who aren’t too quick to get off on “trips,” be they guru-scenes, make-a-million schemes, or a new kind of bean sprout that will change your life. At the deepest level, you are learning about calm and naturalness. So keep things simple. The singleness of purpose of the Taurean, his loyalty, his stick-to-it-iveness, spring from one source: his need for security. Self-preservation … is the hub of the Taurean wheel of life; and the Taurean curls and dies within himself when security—emotional or material—is denied him. Not likely to be grasping, sure to be the embodiment of the idealist form of love, Taurus may himself, or herself, be quite unaware of inner motives, for self-analysis is rarely important to this sign. Instincts are powerful and generally right—always right in so far as they serve the perhaps unarticulated motives of the Taurean, who, while not selfish in the ordinary material sense, sees to it that nothing interferes with the gratifying of his instinctual urge, self-preservation and its more abstracted form, self-fulfillment. The Taurean will not interfere with you if you don’t interfere with him in these essentials, but will fight like a bear at bay for his rights to these things. He is the easiest person to live with, if you are willing to live with him and not against him. Anyone who is going to get along with a Taurean must understand that to him or her cooperation doesn’t mean doing things together; it means doing things peacefully, in a friendly manner, even if the things are done separately. This kind of cooperation annoys people who are less self-sufficient until they learn that the heart of the Taurean comes home to roost only if you don’t try to coerce it, and will break itself against bars of any kind, even if the bars are put up by love itself. Taurus patiently builds things using an inner instinct. Taurus is attuned to the plant kingdom and a love of nature is usually strong in people who have a lot of Taurus in their charts. Taureans are practical and down-to-earth. With your Sun in Taurus your steadfast, easygoing energy helps to keep you focused on your priorities. You’re interested in a life which provides ample opportunities to grow, and your ego self is driven by a need to experience consistency. The beautiful things in life are most valuable to you, and your capacity for love is immense. Learning the difference between stability and stubbornness can be one of your biggest lessons. Since your Sun shows “who you think you are,” you can grow to realize that loving thoughts produce amazing results. Through your Taurus Sun you experience a sense of continuity and stability, and can express your masculine side through establishing as secure place in the world. Whether you choose a career path or family structure as your focus, you are like an anchor and have the ability to provide strength and consistency. It may be important that you to create a home base, and the energy you put into building your home includes both house and family. Your special sensibility toward the environment can grow as you mature, and you may find that your awareness of the importance of preserving the environment and making the best use of resources is behind your most powerful drives. As a woman, you will take great care to build upon the foundations in your life, and may prefer to assert yourself in a slow, steady pace. Your career path needs to provide opportunities for you to establish yourself and grow steadily. Regardless of your marital status, you function best when you have your own money and resources. Although your father may have been the breadwinner and financial mainstay when you were a child, you may prefer a different situation with a husband or partner. Allowing the man in your life to control your finances will ultimately result in a power struggle, if not externally, then certainly within yourself. You can work cooperatively with a partner toward joint ventures, financially and otherwise, and can feel willing to share and contribute to the financial and other needs of your family. You will feel greater autonomy if you also have a separate fund which you control for yourself. You are a person of few words, with religious or spiritual leanings, and slow to anger. You are sincere and just, confident and bold, an interpreter of dreams who can find out secret and hidden things. There is a danger that in the process you will offend others, and your conceit, or confidence, doesn’t help. You are an Earth Sign, which means that you are “cold” and “dry.” The “dry” component means, among other things, that you see distinctions easily, and that you are more swayed by intellectual argument than by passion. You are perceived as being “cold,” an outward appearance of unemotional. In the modern parlance, it fits better with “cold and dry” than with simply “cold.” However, a “cold” type is basically lethargic, or slow to react. The problem with “cold” is that it makes it hard for you to forget slights. Because you don’t tend to lash out immediately, it’s hard for you not to allow your anger to build up. Combine this with a tendency, being “dry,” to prefer the reasonable approach, and you can end up completely out of touch while your emotions run rampant. (in Turkish, Toros Dağlan), a mountain system in southern Turkey. The Taurus Mountains extend 1,000 km along the Mediterranean Sea, forming the southern edges of the Asia Minor Highlands and the western Armenian Highland. The ranges of the Anti-Taurus form an extension of the system to the northeast. The mountains have elevations to 3,726 m, at Mount Demirkazik. In the Central Taurus, a number of peaks rise above 3,000 m, and the relief is of the alpine type, with traces of ancient glaciation; there are karst landscapes in the west. The Taurus system, which was formed during the Alpide folding, is composed primarily of limestones; along its axis it is composed primarily of schists and other metamorphic rocks. The extremely steep southern slopes receive 1,000–3,000 mm of precipitation annually, most of it in winter. Up to elevations of 800–1,000 m the slopes are covered mainly by maquis consisting of arbutus, laurel, myrtle, tree heath, and rockrose (genus Cistus); at higher elevations there are oak and cypress forests. Forests of pine, fir, and cedar of Lebanon are found in the upper zone, up to 2,200–2,400 m. There are juniper thickets and meadows at the timberline. Steppe vegetation grows on the relatively gentle northern slopes, which receive 300–400 mm of precipitation annually, and in the eastern part of the Taurus are mountain steppes and semideserts with thorny pulvinate shrubs. The Cilician Gates form a pass through the Taurus Mountains. (or Bull), a zodiacal constellation (seeZODIAC). Its brightest stars are Aldebaran, El Nath, Alcyone, and ξ Tauri, which are of visual magnitude 0.8,1.6, 2.9, and 3.0, respectively. The two open star clusters called the Hyades and the Pleiades are found in Taurus. The best conditions for observing the constellation are in November and December, when it is visible throughout the USSR. (SeeSTELLAR SKY). A northern constellation; right ascension 4 hours, declination 15° north; it includes the star Aldebaran, useful in navigation. Also known as Bull. Reportedly, the purpose of the extended-time testing of the NK-33 engine, on which the AJ26 first-stage engine for the Taurus II rocket is based, was to demonstrate a 'hot-fire' duration equal to two times a normal Taurus II acceptance testing and launch profile duty cycle. Taurus has other clusters (big NGC 1647, magnitude 6 1/2, is just 3[degrees] northeast of Aldebaran) and lovely double stars other than those in the clusters; begin by checking out 118, Tau ([tau]), and 88 Tauri with your telescope. The range session took place over the course of several days but the big Taurus is a shooter, plain and simple. For weekly stars call 09050 700 405 SAGITTARIUS CAPRICORN AQUARIUS Libra Sept 23 - Oct 23 SCORPIO TAURUS GEMINI CANCER SCORPIO SAGITTARIUS CAPRICORN AQUARIUS AQUARIUS PISCES SCORPIO Talking intensifies some recent dubious financial temptations. Also, Taurus International presented a Taurus Bull Award to Tony Owens, recognizing him as the brand's 2013 Sales Rep of the Year. Bob Morrison, Taurus Executive-Vice President & Chief Operating Officer, "is personal responsibility. Taurus revolvers have set the pace in wheelgun modernization, with the introduction of new designs such as 7 and 8-shot 357 Magnum revolvers. There, a 2000 Ford Taurus driver will spend $3,083 less to operate her car through rain and snow than a driver cruising sunny Ventura Boulevard in the San Fernando Valley in the same car. CANCER GEMINI CANCER VIRGO LIBRA SCORPIO PISCES PISCES For weekly stars call 15609 11450 ARIES TAURUS GEMINI SCORPIO PISCES Scorpio Oct 24 - Nov 22 LIBRA SCORPIO CAPRICORN AQUARIUS PISCES CANCER LEO VIRGO LIBRA PISCES Surprise news can put a different perspective on upcoming travel plans and an unannounced visitor may cause problems. Taurus has made a practice of hiring military veterans, some of whom still actively serve in their respective service's reserves, in both permanent and temporary positions, at their Miami-based factory. Taurus says more of what was "right" in Porto Alegre was sent to Springfield than was sent from Springfield to south of the equator. Most Taurus revolvers I have tested all had very smooth actions and the Total Ti Model 85 is no exception.